Arrive in Da Nang. Pick up and transfer to a local restaurant for lunch. Start to visit Marble Mountains- named as followed 5 elements of universe and stone carving village of Hoa Mai. 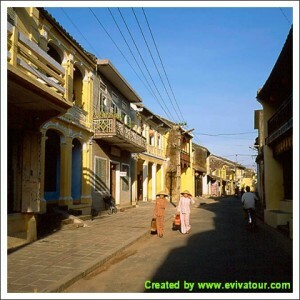 Then move to the ancient Hoi An town for a walking tour around the old sections of Hoi An (charming and wonderfully preserved, combining Chinese, Japanese, and European influences) and bring you back to the 17th century. Take a short relax and soak up the atmosphere. Have a dinner and Over night in Hoi An. Have breakfast at hotel. Enjoy the free time at own leisure until transferring to Hue Airport for the next destination. – Meals: as indicated in above itinerary. – Transfer and transportation by private car. – Sightseeing and entrance fee as per the mentioned itinerary. – Late check out charge at hotel.